Celina’s Mia Rolfes slides in to get the ball away from Wapakoneta’s Morgan Follin as Celina’s Alexa Billger (12) arrives during a Tuesday night Division II district semifinal at Elida. See more soccer photos at LimaScores.com. 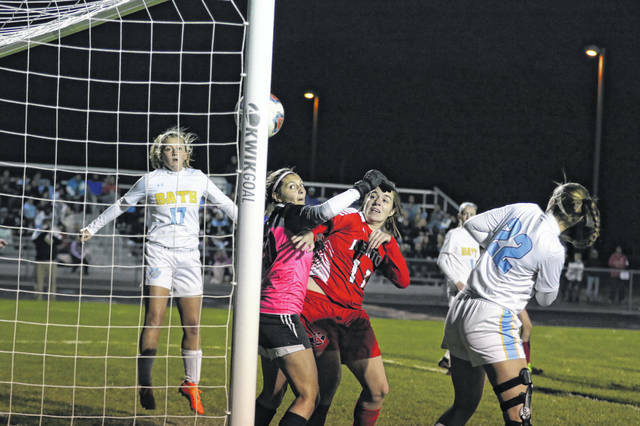 Kenton’s Caitlin Tudor, Bath goalie Emily Rocca and Bath’s Madison Ward (17) and Jordain Craig (22) watch as the ball heads toward the goal during a Tuesday night Division II district semifinal at Elida. ELIDA – Wapakoneta has been here before. That counted for plenty Tuesday night. Wapakoneta responded to Celina’s late game-tying goal with the game-winning goal to post a 2-1 victory against Celina in the Division II girls soccer district semifinals at the Elida Sports Complex. Celina’s Emily Braun tied the game at 1 with 11:39 to go. Wapak’s Emily Ruppert came right back and scored the game-winning goal with 7:55 left to play to make it 2-1. Wapak (10-5-2) advances to the district finals against Bath at 2 p.m. Saturday at Elida. Celina ends its year 11-5-3. Braun’s game-tying goal landed in the upper half of the net from 10-yards out on a pass from Zoey Burns. Immediately after that, the Redskins began surging through the midfield and were buzzing around the 18-yard box. Wapak kept the offensive pressure on and Celina couldn’t get the clear it needed. That’s when Emily Ruppert found a loose ball 14-yards out on the left side, turned and fired it just under the crossbar to make it 2-1 with 7:55 to go. “We had to keep pressuring,” Ruppert said. 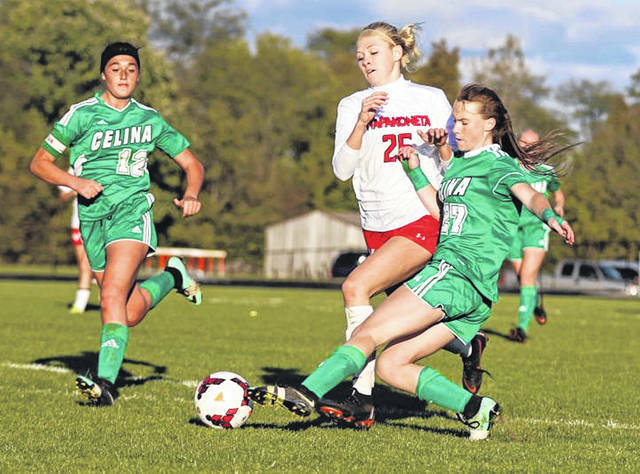 Wapak and Celina battled to a 4-4 tie during the regular season. Wapak had the shot advantage 13-10. Wapakoneta goalkeeper Corrine Raney had eight saves. Celina goalkeeper Kennedy Henry made eight saves. Wapak had four corner kicks. Celina’s Reilly Cox had a goal and an assist off her own corner kicks in the sectional finals win over Shawnee. But, on Wednesday, Celina had no corner kicks. Gerker said the Bulldogs had a different philosophy then when his team defeated Shawnee. The Wapak defense was led by center defenders Torie Carter and Emma Kentner, along with wing defenders Taylor Jenkins and Hayden Lawrence. “Defensively, it was a great night,’’ Foor said. Emily’s senior twin sister, Abbigail Ruppert, scored first at the end of the first half. Abbigail Ruppert got loose on a breakaway and chipped the ball ahead to herself and into the 18-yard box. Off her high bounce, she headed it into the net. That gave the Redskins a 1-0 lead with 33 seconds left before halftime. While Wapak went 5-3-1 in the Western Buckeye League this year, it returned 18 letter winners from a team that reached the regional semifinals last year. Chandler Clark had two goals, Tori Dackin had a goal and two assists and Madelyn Renner had a tally for Bath. Due to the start time, match information was limited due to deadline. This entry was tagged bath, celina, kenton, Wapakoneta. Bookmark the permalink.